Most power ventilated livestock facilities rely on some method of control input to reduce the amount of air exhausted during colder weather. The farm operator calculates the number of animals and their weight to determine minimum ventilation rates expressed as cubic feet per minute or cfm. The volume of air produced by a fan is directly related to its rpm or revolutions per minute. Reducing the operating speed also reduces the airflow the fan generates. The most common method of speed regulation utilizes a device called a triac to regulate the amount of voltage to the fan motor. Although voltage regulation allows for adjustable ventilation rates, there are several disadvantages. Reducing the voltage to a motor also increases the amp draw, which in turn increases operating temperatures and decreases efficiency. Reducing the voltage by 50% doesn’t typically translate to a 50% reduction in speed or air delivery. Since each brand of motor responds differently to voltage reduction, it can be difficult to know the exact ventilation rate a fan is delivering. It is generally advised not to operate voltage-regulated fans at speeds below 40-50% of their maximum rpm to prevent the motor from overheating. Following this advice means using multiple smaller fans for minimum winter ventilation. 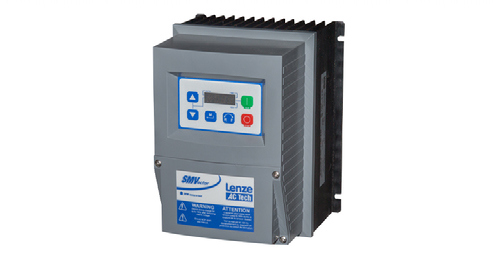 Another method of speed control is Variable Frequency Drive or VFD. A fan controlled by VFD uses a three-phase, single speed motor. A VFD Controller receives a 0 to 10-volt signal from the house controller and sends a corresponding signal to the fan motor in frequency or hertz. Using hertz to control fan speed has a significant advantage over voltage control including less motor overheating and improved energy efficiency. The full range of a VFD fan varies from full delivery down to nearly zero. This lower cfm range permits a producer to replace several smaller minimum fans on existing facilities with a single, larger VFD fan also functioning as a tunnel fan in the summer.